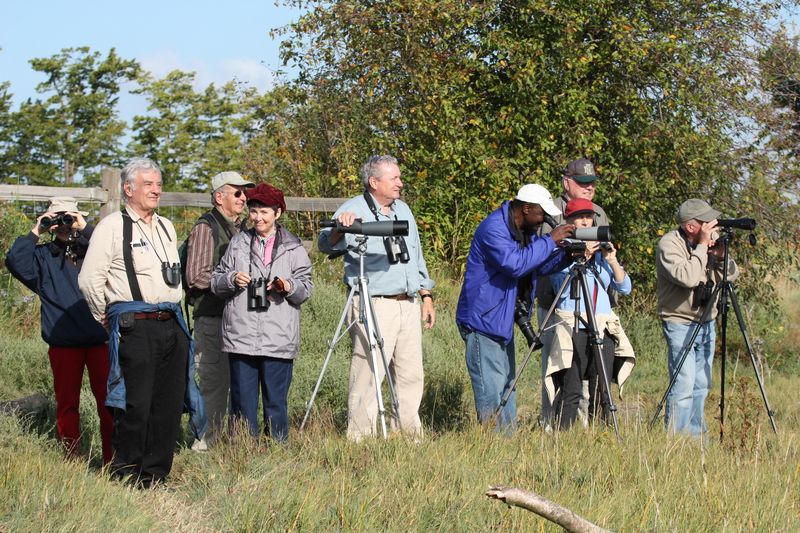 Eleven birders (Lorna, Mike, Eleanor, Gerhard, Roger, Terry, Alan, Lorraine & Jonathan and Sam) joined me at Blackie Spit in South Surrey then on the dike between 104th and 88th Streets and then finishing the morning at the North Forty Park behind Boundary Bay Airport. It was a fine sunny morning, tide coming in, and we saw lots of neat stuff. Hi-lites were: Marbled Godwits and Long-billed Curlew, lots of migrating Shorebirds, American Pipit on a line, another Merlin catching a Swallow sighting, and watching Gerhard demolish any food in sight. Look for Terry’s and hopefully Jonathan’s and Alan’s photos on our Picasa site at http://picasaweb.google.com/dncbirding. We started at Blackie Spit where several Common Loons in various plumages were fairly close to the beach. A number of Seals and Double-crested Cormorants were also in the area. Many Ducks were in the distance and we identified several Horned Grebes in closer. 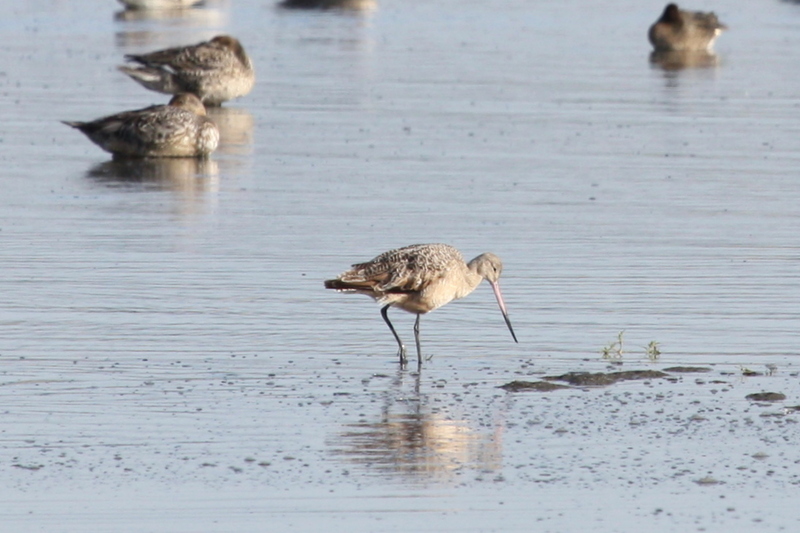 On the inland side, among a flock of mostly Green-winged Teal, were three Marbled Godwits and the Long-billed Curlew. Savannah and White-crowned Sparrows flitted in the grass around us. We saw a few Killdeer, but no other Shorebirds until a few flocks (>2000 birds) of Black-bellied Plovers were roused by something across the river. We love their weaving flights in such amazing unison. Eleanor noticed three Caspian Terns on a small island among the Glaucous-winged Gulls. 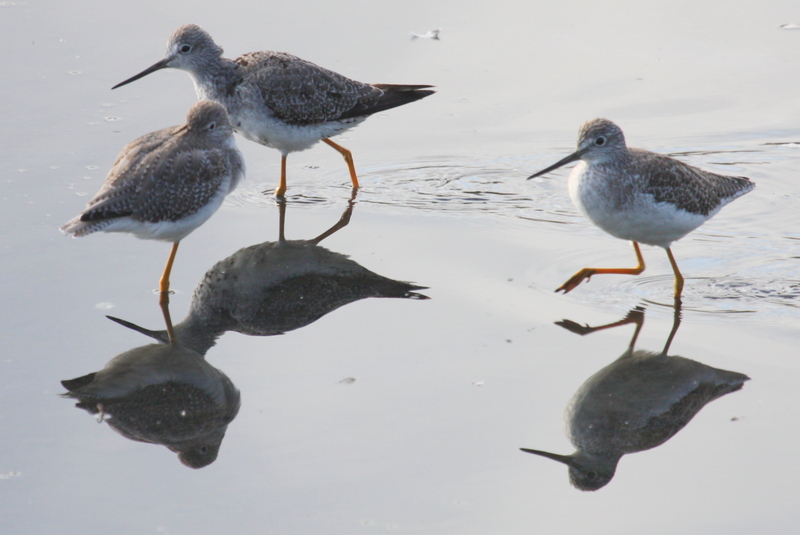 There was a small flock of Yellowlegs, both Greater and Lesser, further on; we learned to identify them by their calls. Mike spotted the resident Belted Kingfisher posing for us on the remnants of an old bridge (I guess). We left Blackie Spit following our Smoko and washroom break where Gerhard started his feeding frenzy with one of Eleanor’s energy bars. When we arrived at the Heritage Airport at 104th Street, the tide was supposed to be in, but the thousands of ducks were too far out to see clearly. And there were no Shorebirds, so we drove to 96th Street. Lorna enjoyed the flock of American Goldfinch on the power line in front of the Mansion. 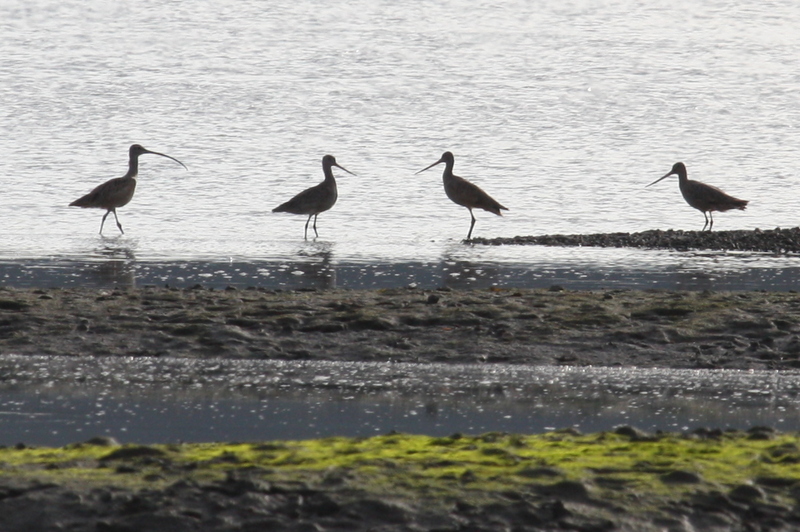 Several Dowitchers, mostly Long-billed, were feeding close in. We saw flocks of Peeps in the distance, likely Western Sandpipers. Then the coup-de-grace of the outing occurred, Birder Extraordinaire Russell Cannings wheeled in on his 1993 Outback. He immediately pointed out an American Pipit, posing uncharacteristically on a power line. Then a Savannah Sparrow did the same. A small flock (6 birds) of Peeps flew by about 10 miles out (my exaggeration) and Russ identified them as Semi-palmated Plovers by the call he heard. Give me a break, this guy’s awesome. A Merlin whipped by and we followed him as he nailed a Barn Swallow over the field and continued out to the Bay and landed so we could watch him in the scope enjoying his lunch. Meanwhile, Gerhard, who had stopped at every Blackberry bush we passed this morning, was hiding in the back of my SUV gorging all the Trail Mix (the good one with Smarties). On the way back to Petra’s, we decided to stop at the North Forty where Russ had seen lots of Warblers and a Scrub Jay earlier this morning. We did a quick jaunt through the Oak trees, saw lots of Cedar Waxwings, American Goldfinches, Warblers (looked like Yellow-rumped), a Flycatcher (probably Willow), but no Scrub Jay. It was after 1:00 p.m. when we got to Petra’s but everyone was pleased with the beautiful weather and an enjoyable and productive outing, especially stuffed Gerhard. I will be at Petra’s next Monday, September 26, for departure at 7:30 a.m. on an outing “somewhere around the Bay”. Again, comments welcome, check out our Blog for earlier outing reports and photos at https://dncb.wordpress.com/, and let me know if you don’t want to receive these literary gems. 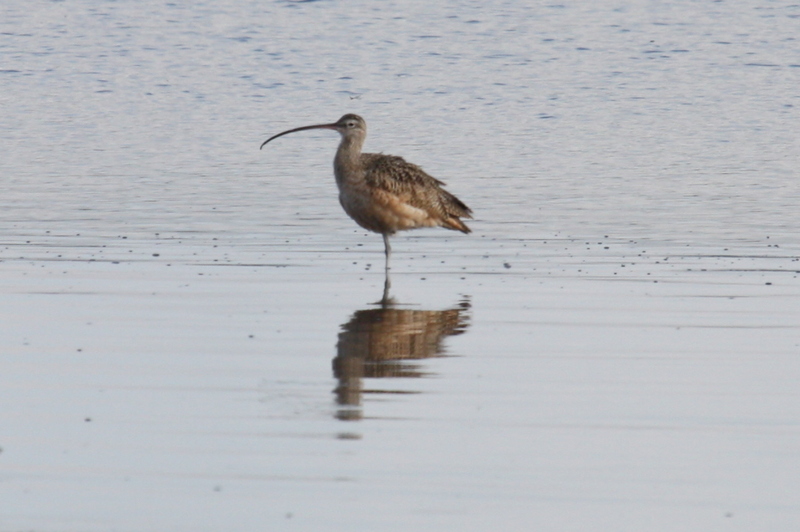 This entry was posted in *DNCB, 104 Street, 96 Street, Blackie Spit, Long-billed Curlew, Marbled Godwit, Merlin, North Forty/VWS, Scrub Jay. Bookmark the permalink. Is there some other type of sandpiper in the foreground of your Marbled Godwit pic? Hi I’m Damion and a member of the Chilliwack Field Naturalists.